In relation to my previous post about reducing our plastic consumption, I've been taking a closer look at all of the plastic coming into our house, and immediately saw what our (plastic) achilles heel is: Costco. In a day when food prices are going nuts, we're trying to save on many fronts. Most of those also happen to bring our food closer to home: gardening, having chickens, gleaning, picking fruit locally, relying on local folks for our milk and meat, etc. But then there are the things that are certainly not at all cheaper to buy locally. Number one on the list would be bread. We've got a couple of wonderful local bakeries that make awesome organic whole-grain breads. The rub? They're over $4.00 a loaf these days, eep! At Costco I can get two loaves of sprouted organic whole-grains bread for about $2.50 a loaf. Which, when you've got a son who eats as much as mine does, and a daughter who just joined the swim team (in addition to dance, horseback riding, karate, and bicycling everywhere), well you go through a lot of bread, so that really adds up. But unfortunately Costco likes to sell things in bulk, which means that you can't just buy one loaf of bread, you have to buy two of them. And they have to wrap them all up in extra plastic so that they're bagged up together, which is pretty irritating but not enough to make me spend $1.50 more for every loaf. I know, I know. I should make my own. I've tried. A couple of times. The kids have begged me not to try again. I can make white-flour loaves that come out just fine, but whenever I try to add in the nutritional density of my favorite organic loaves, mine just come out...well... dense. And not in the nutritional sense. I'm contemplating a bread machine, but until then it's probably going to be Costco and the extra plastic bags. Anyone who has a fool-proof seriously nutritious yet fluffy and wonderful tasting bread recipe, feel free to let me know! Check Out the Chia Potato! When I was a teenager, the first Chia pets were introduced. They were one of the big fads of the eighties, along with giant plastic combs, painter's pants, and pet rocks. So when my neighbor looked like he was growing the world's biggest chia pet in his backyard, I asked him what was up. As it turns out, it's a vertical potato cage, built similarly to this one. The idea is to build a big circular cage, fill it with compost and dirt, and grow potatos vertically in a small fraction of the space needed to grow them in rows. According to Fred's Garden Gate, you can grow half a bushel a for a horizontal foot. I'm hoping that maybe it also works with yams, since we don't really eat many potatoes. I'll let you know how my neighbor's Chia harvest goes! Chris Jeavans, a U.K. mom is trying to go an entire month with no new plastic things of any kind. A very worthy endeavor, and I'm sure it's surprisingly hard to do completely and thoroughly (her blog today is about brushing her teeth with boar's bristles, quite entertaining). It seems that plastic is endemic in our lives these days, and the amount of plastics that are ending up in our oceans and environment is truly horrifying. As the article says "The UN Environment Programme estimates that there are 46,000 pieces of plastic litter floating in every square mile of ocean on Earth." That's just tragic. So while I don't think I'm ready to try and live completely without plastic, we have been signifigantly reducing our plastic intake and output over the last few years until it is relatively low. Once one thing has been eliminated, I usually try and target something else to find a non-plastic replacement for (Legos notwithstanding). So I thought I'd go through our own recycling and pull out everything plastic for perusal, and this is what I came up with from our 2-weeks of recycling and garbage. In addition to this, there were some "foil" YuGiOh card wrappers that I suspect had plastic in them, and a few odd tofu dog packages and cheese shrinkwrap that I didn't fish out of the garbage, but this is basically it for our plastic consumption for two weeks: three Odwalla bottles, the YuGiOh card deck packaging, a fig bar tray, and two plastic tubs, one was romano cheese and the other some little cookie thingies that we bought for our running relay team. - We get milk in glass bottles from a local farmer. Even before we had a direct connection, we were able to buy cow's milk both here and in Washington in glass bottles with a deposit. 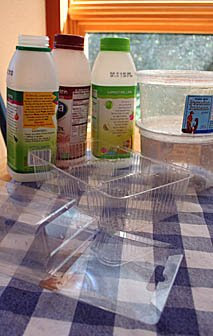 - Eggs from our own chickens, we re-use other people's egg cartons. - Our meat comes from a local source, we buy 1/4 cow and 1/3 pig at a time. All the meat is frozen and wrapped in paper. No plastic-wrapped styrofoam meat trays. - Hubby makes his own mochas at home (pretty much a cost-saving measure for him over Starbucks, but it has the other effect of cutting down on plastic coffee cups). - We don't buy bottled water. We refill our reusable water bottles from the water filter on our tap. - I use cloth bags for carrying groceries. After years of forgetting my canvas bags at home, I bought a half-dozen Chico-bags which stuff into tiny little stuff sacks and clip via carabiner onto purse straps or backpacks. I'm never without a bag anymore, these things are the greatest! If you don't like this style, Reusablebags.com has dozens of different kinds of reusable bags and bottles. According to the EPA, over 380 billion plastic bags, sacks and wraps are consumed in the U.S. each year, simply a staggering number. Just reducing this one usage of plastic would be such a great step. One thing it took me awhile to figure out was that I could also use these Chico bags for every other store, not just the grocery store. The pharmacy or book store or wherever I was shopping, I just had to be quick enough that they hadn't already started bagging my stuff in plastic. So now I get very very few plastic bags. I had to borrow some from a neighbor one day when I needed them for a project. - We wash and re-use ziploc sandwich baggies, and also re-use bread bags or any other plastic bags that we do end up with. They get lots of life at least before they go off to a landfill. 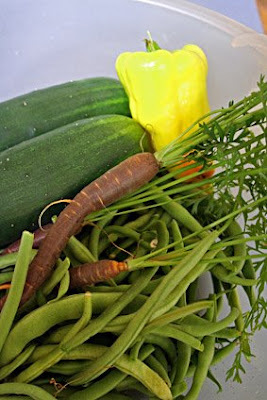 - Each year, more and more of our fruits and vegetables are coming from our own gardens and trees. That eliminates produce bags and any wrapping that comes on trucked-in produce as well as those awful clamshell thingies that they package supermarket strawberries and other fruits in. What we don't grow, we try to pick or buy locally as much as possible. - We don't buy wipes, napkins, paper towels, swiffers, etc. Our kids used cloth diapers. We buy laundry soap in big cardboard boxes, toilet paper that's not shrink-wrapped, etc. etc. etc. By eliminating many plastics, we tend to buy more locally, pouring more money into our local economy and less into fuel-sucking trucks to ship in plastic-packed produce, meats, eggs, milk, and other stuff from far locations. It's a win-win on so many different fronts, that it's worthwhile to even just pick one thing and try to eliminate that plastic source. Looking at all of this, it's surprising how far we've come. Most of these steps came gradually over time. Like buying a few cloth napkins at Goodwill, then accumulating a few more and a few more until we reached the critical mass where we no longer needed to keep other napkins in the house. Same with cloth grocery bags or other items. Some things took awhile to get into place, like the gardens, chickens, and local sources for meat and milk. Other stuff is relatively easy and enjoyable, like shopping at the local farmer's market. I have many more things in my sights, like I just started making my own yogurt, since yogurt containers are an endemic source of plastic. Little by little, we're getting there. I'm not ready for that boar-bristle toothbrush just yet though. We drove up to our favorite organic blueberry farm along the McKenzie river yesterday, with kids and/or parents from two other families in my car. I had also taken orders for flats of blueberries from two other friends. 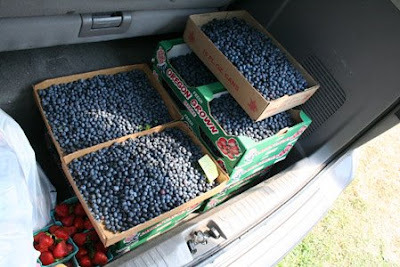 We picked for about two hours with the kids, and came home with over 25 pounds of blueberries for our family. I also bought a flat, and I'll put them in ziploc baggies and freeze what we can't eat in the next couple of days. This winter, we can eat our local blueberries (and strawberries, and cherries and blackberries and dried apples and plums) instead of eating fruit grown and trucked up from South America or New Zealand. I'm glad that my kids not only got to have a great time yesterday (we also visited their favorite fish hatchery for a picnic, and the blueberry farm has a big rope swing and lots of kids running around) but that they are connected to the seasons, to actually manually picking their own food, and to the people who run the farm that we always go to. Building relationships with growers and with the land is an important part of the cycle that starts when you try to eat more locally. I'm about to go and blanch some green beans from our garden as well. This year I planted four varieties, two bush beans, scarlet runners, and blue lakes. We should have lots for the winter! For those of you bicycle lovers interested in climate change, check out The Climate Ride from New York to D.C. Doesn't that look like fun in a meaningful way?? ?